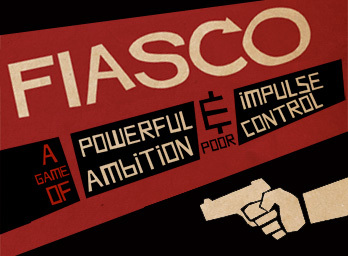 Note: This is my last post in my series on our first experience with Fiasco, and why I designed a new playset for our first game. It makes sense to start from the beginning of this series of posts, though. That’s here, but you can also see the whole series (in reverse order) on this page. If you’ve read this far in this series, you have probably come to your own conclusions about how well the playset (and the thinking behind it) fed into the game as we played it. All in all, I think it worked quite well. In fact, the flubs in terms of playset design mostly had less to do with all the concerns I mentioned, and more to do with the flexibility of the time-setting. Next time I playtest this playset, I’m going to insist on it being played in the present, just to test out this theory. We had a group of five players, four of whom were expats (all but Miss Jiwaku), and yet we had a good mix of Korean, foreign, and “gyopo” (Korean-blooded foreigner) characters. There were English teachers (Korean and foreign), an office worker (Korean), and an American GI-character. All of these characters to some extent embodied elements of certain stereotypes, but none were offensively so, nor did any of them seem particularly stereotypical in themselves, or in how they were played out. Given the majority of the players were expats, it was not surprising that the locations chosen were the sort of places expats go to: a hakwon, a Canadian-expat bar, apartments. I wonder whether a higher number of Korean players might have chosen other locations. Similarly, I wonder what kinds of crimes a more Korean-heavy group of players might have come up with. But all in all, we had a really good group, and everyone did a great job not only playing their own styles, but working with one another’s styles. Whether the playset contributed to this, I’m not sure… I’d like to think it helped, but I can’t be certain. I will repeat one point from earlier, though, and that is that playsets need to be nailed down in time. I love the idea of a playset set in 1997 Korea, with all the craziness of economic collapse… but it’s not possible to set up the playset to work for both that and a contemporary setting without a lot more careful jiggering and poking than I managed my first time.